Restaurant special offers need to be practical and profitable, as well as being tempting and delicious. Each of these areas need to be addressed in order to ensure that you’re not just selling what you want to sell, rather than what customers want and what will make you money. If you’ve ever passed a little coffee shop or gift shop and thought ‘how on earth do they stay open?’ because either everything is over-priced or so specific to the owner’s taste that it is unlikely to appeal to anyone else, then you’re half-way there! The trick to making sure that your special offers are profitable and appealing lies in following these four key rules. The price of your special offers will either be too low to make a profit or too expensive to appeal to customers unless you make judicious use of seasonal ingredients. Now, that doesn’t mean that customers will be impressed with a whole load of seasonal cauliflower by itself, but if you think of adding a small amount of delicious local cheese and baking it with crumbled local cured bacon and homemade bread, you’ve got a lovely dish that sounds impressive but has a great mark-up. Careful use of expensive ingredients will help to list the customer perception of value of your special offers. For example, a simple spring vegetable risotto can be very cheap to make (even with very good ingredients) and if you add perhaps three asparagus tips artfully perched on the top, it will seem far more luxurious. There are certain ingredients that have a great added value perception, so as long as they are used stylishly in a way that compliments the other flavours, it can work wonders for your menu. Try saffron, king prawns (even one on top of a fish or seafood dish), truffle and truffle oil, venison (this can be very affordable if you find a good local supplier), exotic ingredients like wasabi, 70% dark chocolate and fresh berries as a way to increase the overall impression of your special offers. In a similar principle to using very small amounts of fancy ingredients to boost your specials’ profitability, offering interesting side dishes is a great way to ‘bulk out’ the other ingredients without resorting to chips, chips and more chips. 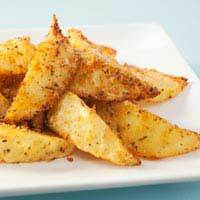 Try these ideas for cheap ways to add value to your side dishes and keep the gross profit levels of your specials high - champ instead of mash potato (buttery mash with lots of chopped spring onions and cabbage mixed in), paprika- or chilli-roasted potato wedges instead of chips, roasted sweet potato instead of old potatoes, a rocket and red onion salad instead of a standard ‘green salad’, roasted vegetables instead of just boiled…the list is endless! Let your chef get really creative with the sides using seasonal vegetables and see your profits grow. You’re far more likely to sell out of your specials if you name them in a way that sounds tempting, fresh and tasty, so take your time to get the name right. That doesn’t mean that you need to pretend to be French and go over-board with the descriptions of everything, after all, the trend now is to be clear with menus rather than the faux-fancy of a few years ago. Wouldn’t you rather buy ‘pot-roasted free-range local chicken with seasonal vegetables in a Riesling broth’ than ‘meat and two veg’!? Remember the words that tempt people – creamy, char-grilled, crispy…one of two sprinkled through the description makes all the difference. It’s also good to shout about the provenance of your local ingredients too.